“It may be more prudent to create high density clusters of multi-function spaces and transport hubs than a continued urban sprawl” architect Simon Griffiths from UK said, speaking at the 34th National Conference on Architecture on February 15. Addressing a gathering of more than one thousand architects, public officials, general public, students and media personnel at the BMICH, Griffiths shared his ideas and experiences gathered working extensively in Asia as an Executive Principal for Aedas; a global architectural and design firm considered to be among the top 10 in the world. The National Conference on Architecture is organised by the Sri Lanka Institute of Architects. This year’s conference theme was ‘Return of the City, Megastructure redefined”. Architect Thilan Koththigoda of KWA Architects chaired the session. 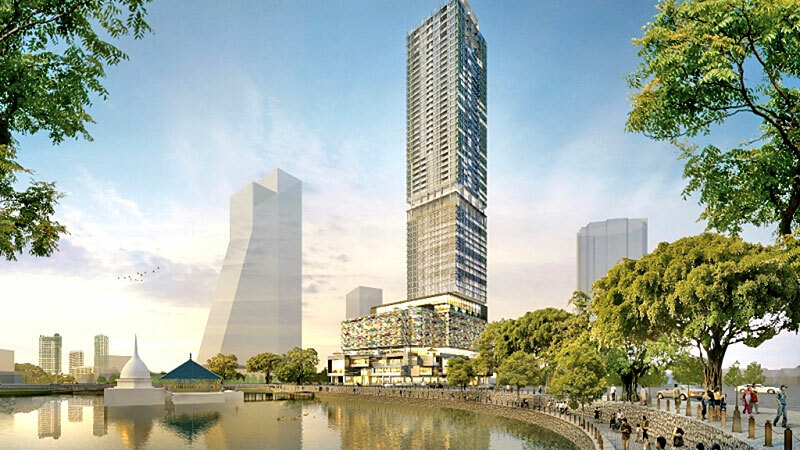 Aedas along with their Sri Lankan counterpart KWA Architects are the designers for Colombo City Centre, one of the largest mixed developments under construction in Colombo with over a million square feet of space spread over 48 stories including luxury apartments, city hotel & a multi-level retail mall. “Densification of existing cities with mega structures or high density buildings with integrated transport hubs, parks, work, rest and play lifestyles may become the model that all future cities need to move to” Architect Simon Griffiths further elaborated concluding the session. As the cities expand with high rise complexes so does traffic. The designers must concurrently take into consideration the increased demand for infrastructure, sewerage,water supply with adequate water pressure for fire fighting and transportation road network.